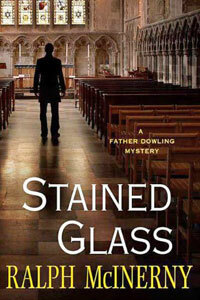 Stained Glass by Ralph McInerny: Synopsis and Online Purchase Options. Synopsis (from the publisher): Tough times and the unsolved murders of anyone with ties to the Deveres — a family of wealthy parish patrons — back Father Dowling up against a wall in his struggle to save his church from the chopping block. With too many churches and not enough people to fill them, the Archdiocese has to make some cuts, and many of them, including the proposed closing of St. Hilary's, are dangerously close to the bone. Father Dowling rushes to drum up support from church officials and parishioners, including the Deveres, who don't want to see the stained glass windows they donated go anywhere other than the church they were meant for, but they can hardly be of help when those closest to them start turning up dead. Church politics, long-kept family secrets, and a determined killer come together to put St. Hilary's — a church that countless characters and devoted readers have come to love — and its parishioners in peril.